In celebration of World Autism Awareness Month, ASP Sta. Rosa families joined the flag ceremony at the Municipal Hall on 18 April 2016. 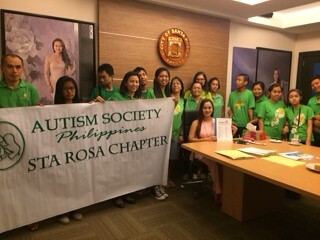 We spoke briefly on the our autism advocacy and ASP’s nationwide 1Pangako campaign. Mayor Arlene Arcillas kindly met with ASP in her office; and signed our 1Pangako pledge sheet. Visibility in the community is one important aspect of our advocacy. Face time with the chief local executive to articulate our needs and our priorities is a hallmark of genuine and meaningful government engagement. About the Contributor. Olive Medina is mom to CWA Enzo and his baby sister Lizzie. Aside from fulfilling her duties as a wife and mother, she works as General Manager for a logistics company, a part time college lecturer and part time yoga instructor. She is also the president of ASP Sta. Rosa Chapter.